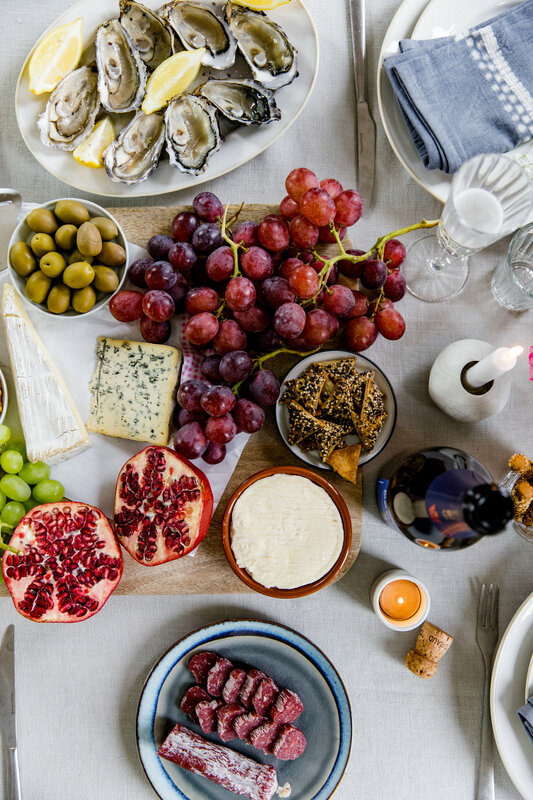 I have always loved hosting parties, dinners and apèros (French for pre-dinner drink and appetiser) for friends. There's nothing better than the sound of chatter, clinking glasses and the smell of good food wafting through the air - I've been known to cook a Sunday roast for up to 12 people, which I might say is no mean feat considering the size of oven I have in my French flat - but I've been away so much lately that there just hasn't been the time to invite people over, let alone cook at home! I’m always looking for new ways, and of course, excuses to prepare food and a pretty table. 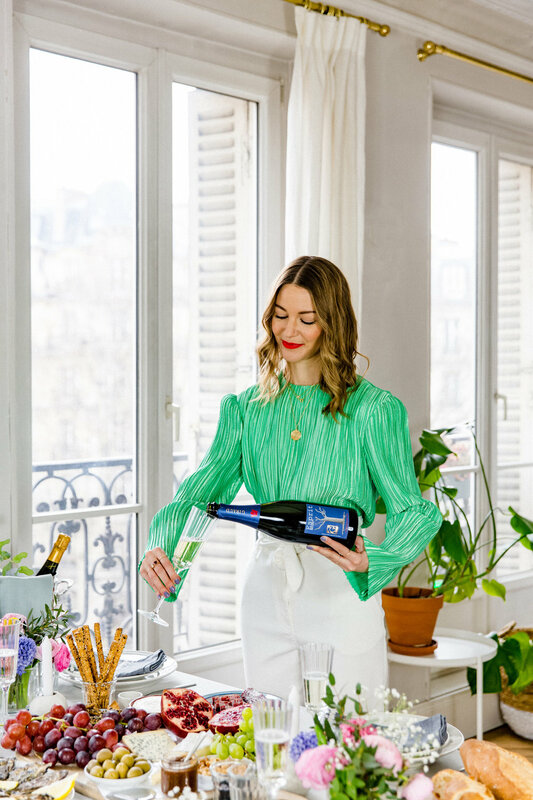 With Spring on the horizon now that the snow seems to have finally melted, I wanted to create a beautiful Parisian-inspired champagne party, so I could buy flowers, eat oysters, pop a few champagne corks and invite friends over. I teamed up with Henri Giraud, a prestigious champagne house nestled in the commune of Aÿ, just south of Reims (for those of you who know your geography) that has created some of the world's best wines for the past 10 centuries (!). They have just launched a new zero-pesticide style, called Esprit Nature - the first to do so in Champagne, and have even established a unique partnership with the National Forestry Office, to preserve Argonne oak (the wood used for their barrels). No need to feel guilty when consuming more champagne! And in my five years of living in Paris, I've learnt a thing or two about Parisian dinners, French aesthetics and food and alcohol pairings, so I thought I'd share them with you. This is the most important part of your champagne party, it is a Parisian one after all - and as you're probably aware, the French take their food and alcohol enjoyment very seriously. The right food is key. Oysters are an obvious pairing, but that's because they taste so good with champagne or sparkling wine. Always serve on ice with lemons and open so guests can easily help themselves. Creamy cheeses pair really well with champagne - I'd opt for brie, and even blue cheese if you have a stronger palette. One of my favourite French cheeses is Saint-Félicien - it usually comes in a terracotta ramekin, and is deliciously creamy, but with a stronger taste than brie. Charcuterie is a great addition - pick a well cured style and a saucisson - preferably one with less fat. My favourite is 'la fine' by Saint Agaûne. Finally add nuts, black and green olives and then fruit. Black and white grapes are a good option, as well as figs when they're in season. Set the scene, but don't go overboard. French women tend to choose a good pair of jeans and a pretty top for evenings (Rouje and Sezane are great French brands for inspiration) - i.e. nothing too fancy or over the top. This is a dinner, not the Oscars. Comfort and wearability are paramount, and always leave a little to the imagination - that special je ne sais quoi. I opted for white jeans as spring is (hopefully) around the corner (there are blue skies as I write this and the temperature has risen a good 9 degrees today) and a bright green top that is perhaps a little less Parisian, but I felt the pop of green was perfect for the setting. There is indeed a fine art to pouring champagne. This is a no brainer - but serve cold. Then place your thumb into the bottom of the champagne bottle, which is called the 'punt', with your four fingers supporting the bottle. Balance the neck of the bottle on the side of the glass. Tilt the glass to a 45 degree angle, this will help reduce the bubbles created whilst pouring, in the same way you should tilt a pint glass when pouring beer. This also allows the champagne to breath. Fill the glass around 2/3, never right to the top. Thank you to Henri Giraud for sponsoring this article, thank you to La Trésorerie for providing the props and merci to Patriksson Communications for supplying my outfit. Creative Direction and words by Marissa Cox. Photography by Monika Varšavskaja, edited by Marissa Cox. With assistance from Amanda VanOsdol.